As mentioned in my previous post, I had to save an image of one Great Egret for its own space. At the beginning of this year’s breeding season I was able to catch a lovely model, sporting a shocking green lore — the area between the bill and the eyes. 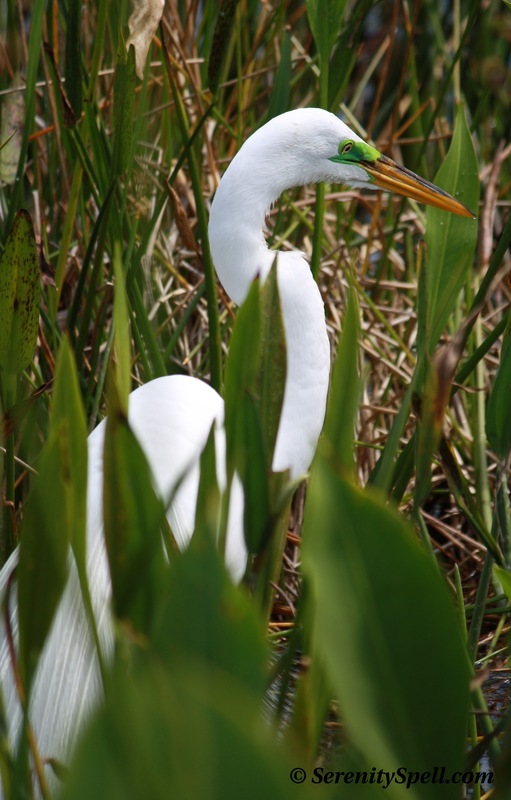 During the breeding season, the lore may turn a vibrant green; the Great Egret will also display long, elegant plumes on its back (evident in the second picture, slightly blocked by the swamp vegetation), which are used in courtship displays. Like a peacock, the feathery plumes will spread out like a fan. Outside the breeding season, these long feathers disappear. 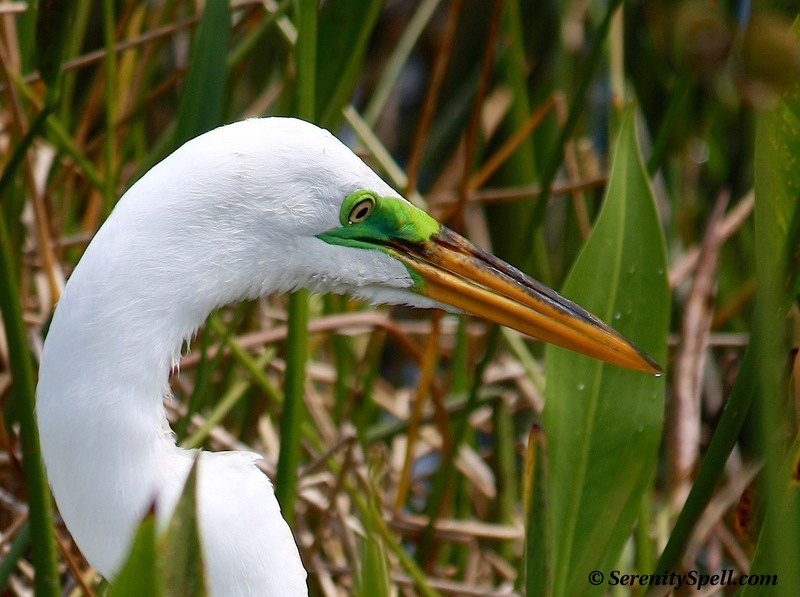 Great Egrets are striking to spy in the swamp — their ethereal beauty, graceful stalking, and quiet strength is captivating. But the brilliant green lore and feathery plumes add yet more stunning display to an already magical scene. Great photos,, and catch of the egret at its breeding height. I’ve never seen lores quite this green. Thank you. Amazing green. Amazing creatures! You’re so welcome, I’m glad I could share a glimpse of this amazing animal! Nature’s truly stunning with its brilliant coloring… Otherworldly. Wow! Had no idea there was such a creature. Very cool!! They’re amazing…. And in our area, with our wetland environments, thankfully plentiful. I’m not exaggerating when I say they’re an unreal sight in the swamps; so beautiful, even after all these years. Wow – these shots are amazing! HAHAHAH!!! We think along the same lines…. I’ve said exactly those words as I’ve been out and about, spying all the pretty boy birds and critters. So funny. This is so beautiful!! I have always wanted to buy myself a nice camera and go on an outdoor expedition (e.g. camping, hiking, wandering in fields, etc.) just to get an authentic outlook on the natural world. Personally, I find this post very inspiring. I think the macro-style shots really contribute to the inspiration. I hope you keep publishing posts like these. Cheers! Thanks so very much! I’m definitely more of the “hiker-with-a-camera” variety… My poor Canon gets a beating on some of our hikes (especially in the Everglades!). But it’s worth it. 🙂 I’m yearning for a macro lens now (this actually was taken with a normal telephoto), to get those crisper details. We’ll see, we’ll see…. Thanks again for the follow and the kind words! Thanks so much — I definitely don’t take it for granted, this access to such unique wildlife and flora!! Beautiful photos! Thanks for sharing this wonderful post. Thanks so much! I was very lucky to snag this image, as he was far in the wetlands… It was breeding time, and this brilliant green only appears then. Nature is simply magical…! I didn’t know about the green lore. Fantastic photos and interesting post. Is it only the male that gets the green.